Firepits are very popular. It is great to sit around with family and friends and enjoy a nice glass of wine - or whatever suits your fancy!! Firepits can be built to your taste with custom sizes, shapes and different building material. You can also lay a grill on top and cook on it or just roast hotdogs and marshmellows. 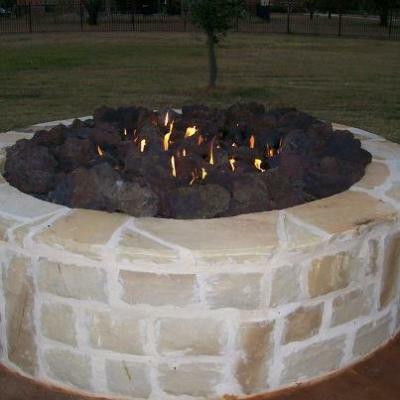 If you would like to receive an estimate for a custom firepit to be put in your backyard give GroundScape a call. GroundScape www.groundscape.com is a Fort Worth Texas Landscape company that specializes in landscape construction. Please give us a call at 817-759-0102 or email us at joe@groundscape.com.